ONI Bureau: While Prime Minister Narendra Modi launched an indirect attack on BJD Government in Khurda on December 24, his tone and approach completely changed as he remained silent on CM Naveen Patnaik and BJD in Baripada today. He rather attacked the Congress Party, which is fighting for its survival in Odisha. 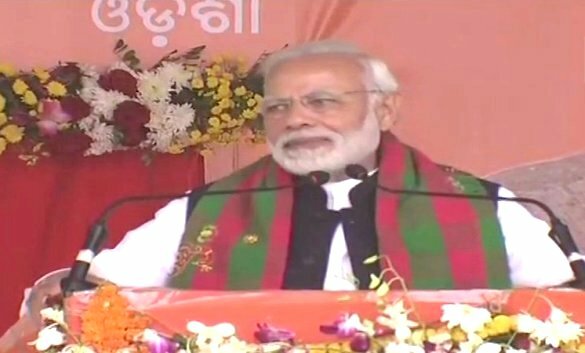 The BJP leaders and workers were left disappointed as they expected PM Modi to take on BJD Government in Odisha in the wake of CM Naveen Patnaik taking an aggressive stand against the Centre on various issues. But, it did not happen. While Senior leaders including Dharmendra Pradhan and Aparajita Sarangi kept lashing out at Naveen Patnaik and BJD, Modi has decided to avoid any confrontation as on today. Barring a few issues such as Pipli gangrape, healthcare (including Ayushman Bharat), employment and women’s safety, the Prime Minister preferred to go soft on the state government while attacking the Congress more. Whether the issues of ‘Bharat Mata Ki Jai’, ‘Ban on Vande Mataram’, ‘stopping pension of Emergency prisoners’, ‘Rafale Deal’ or various issues, PM Modi slammed Congress and accused it of playing dirty politics. He also listed various achievements of the Centre, including Ujjwala scheme, infrastructure etc. He also talked about the development projects launched/announced for Odisha in the last four and half years. Earlier, he welcomed people in Odia as well as Santali language and also paid tributes to legeds such as Ramchandra Bhanjadeo, Pandit Raghunath Murmu and Purnachandra Banjadeo. The PM also hailed the culture of women pulling the chariot of Devi Subhadra in Baripada during Rath Jatra.